– Invites you to enjoy days filled with fun and true adventure! The resort with its new, fantastic water park and a mini golf course, blends exciting activities for children and adults alike, so that there is something for everyone to have a fun-packed, yet relaxing experience. As Cancun’s most welcoming, beachfront resort, All Ritmo will let you feel true, Mexican hospitality as soon as you enter the grand lobby. Decorated in a contemporary style with a traditional, Mexican flare, it features spacious and bright rooms. Complimentary cocktails and beverages can be enjoyed at the bars while the resort’s themed restaurants will serve you sumptuous meals. 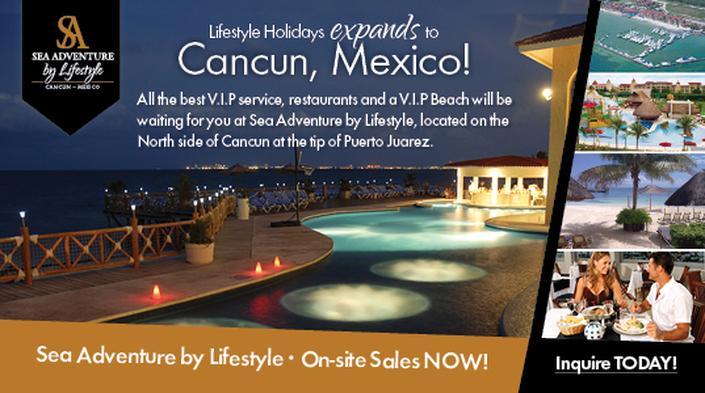 Whether you play and tan on the beautiful white-sand beach, take a dip into the large abstract-form pool, that includes a children’s swimming area and inset Jacuzzi s, or simply sip refreshing cocktails, you will enjoy an oasis of family fun on your Cancun vacation, at All Ritmo by Lifestyle. Throughout the day complimentary drinks such as beer, sodas, and fruit smoothies can be enjoyed. You can always find a sumptuous snack or mouthwatering meal to feast on in one of the resort’s themed restaurants and bars. All-Inclusive is mandatory and is paid to the resort at check-in.